Two years after their wedding, bride gets to dance with her paralyzed husband ! Lauren Jackson describes the first time she met her husband Joel as love at first sight. The pair were freshmen in high school and quickly began dating, but eventually the pair drifted apart and went their separate ways. Lauren and Joel went to different colleges. Years went by, but Lauren never let her feelings for Joel go. "I was still head over heels for him and he had no clue," Lauren wrote on her blog. "I knew he and I were made for each other." In December of 2009, everything changed for Joel and Lauren when Joel was involved in an automobile accident and was ejected almost 50 yards from the vehicle. Joel's head was internally disconnected from his body. After a promising surgery, Joel was stable but doctors told his family that he'd never walk again -- he was confined to a wheelchair. After the accident, Lauren and Joel's relationship grew. In 2012, the pair began dating again, and in 2013 the couple was married. 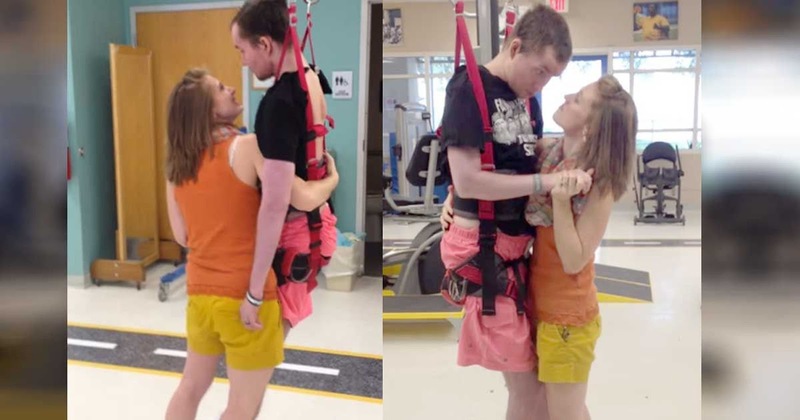 Last month, while strapped to a harness during physical therapy, Joel was able to stand for the first time in months. Lauren seized the moment and shared a standing dance with her husband. "I was just in awe," Lauren wrote on her blog. "It was one of those moments that took my breath away."